There I was in the local mall with my wife. She needed an extra USB hub for use with her college's notebook PC. [Don't worry; she also has a MacBook Air.] We thought, why not try the Microsoft store first? That's because we couldn't find just the right USB hub at Best Buy the last time we were there. We could save a trip. 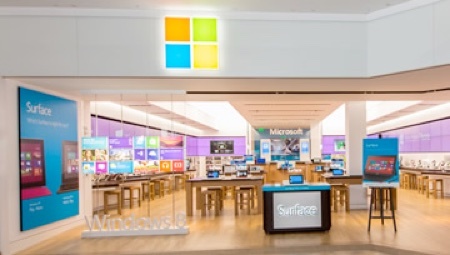 The Microsoft store at Park Meadows Mall in Lone Tree, Colorado is a very nice store. It has pretty good wall of essential accessories, and we found a splendid Belkin 3-port USB hub for not much money. John: Do you accept Apple Pay? He walked over to a wooden table, pulled a drawer open, and there was one of those point-of-sale terminals with the display, electronic pen, keypad and, lo and behold, the NFC symbol. John: This is very interesting. I never thought a Microsoft store would accept Apple Pay! Salesman: [with a smile] Money is money! So I prepared my Apple Watch for Apple Pay and leaned over, almost touching the terminal. I tried my iPhone 6s. Salesman: It was working before. Don't know what's wrong. I guess you'll have to swipe your card. I did, it worked, and we were on our way. I commented to my wife on the way out. Wow. This is brilliant. Microsoft is doing more and more cool things.